Reworking of existing logo and integration of all related branding for a Canadian-manufacturer of high-end bicycles. Applications included: Y2K decals, paint masking and graphics, series logos, tubeset logoing, wheelsets, suspension systems, in-house “aftermarket-style” components and clothing. The challenge with any product catalogue is to create a selling tool for dealers that organizes the product and tells the story that differentiates them from their competitors—yet be interesting and cool enough to appeal to the intended consumer. 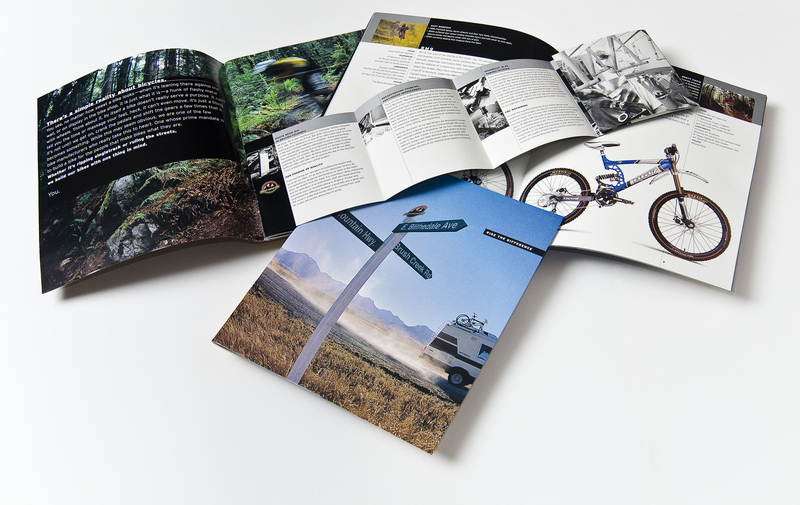 To accomplish this we tapped into the psyche of the various “riders” of Rocky Mountain bikes, using team riders and long-time cyclists who told their own stories to convey their passion for riding, and indirectly identify with potential buyers and existing riders. The small insert featured the handbuilt in BC story which is an important selling feature as compared to other bikes which are mass built in Asia. The catalogue was also designed to accommodate French and German translations with a single black plate change.